In my earlier post 10 small business ideas in garment industry, I have mentioned subcontracting (job-work) is one option for entrepreneurs to start business with low investment. In this post I will explain the procedures of subcontracting in apparel supply chain. Subcontracting can be defined as doing partial work of a contract that is originally received by other. The companies those do subcontracting are called as subcontractors. They are also known as job-workers. 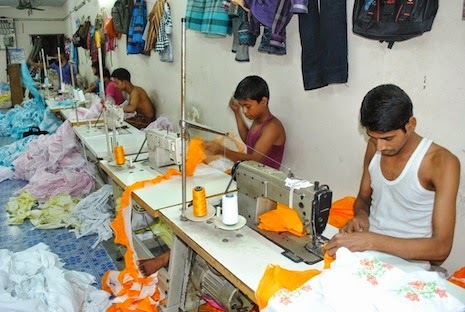 In the garment industry, a subcontracting unit is a factory that mainly does garment stitching work. They don't need to set-up other facilities and staffs for layer cutting, garment finishing, and packing activities. In apparel supply chain garment exporters receive original contract from apparel brands, international buyers or retailers. These export houses get their excess production done from subcontractors. An export house can also work as a subcontractor. When an export house doesn't get enough direct business they take work from other export houses. So there is no fix definition that sub-contractors only sew garments. They can take subcontracting work from cutting to packing, provided they have in-house facilities for these. Followings are few visible reasons for existing subcontracting business in apparel industry. Uncertainty of order volume round the year - Garment exporters set up their factory based on average order quantity. When they get excess orders in pick seasons, export houses prefer getting production done from subcontractor. It is also found that exporters get production done for part of their total orders from outside in all seasons. By getting production done from outside, exporters save on overheads cost. They don’t need invest on building and machines those could not be utilized in full year. Getting Control over manufacturing cost – This applies to brands. By sourcing fabrics and other raw materials, brands can reduce manufacturing cost of garment. Also brands can controls quality of raw materials keeping sourcing on their hand. Keep away labor issues - Domestic brands are changing their sourcing strategy. They now started sourcing garment based on Cut to Pack, instead of FOB orders. In this process they don't need to set up factory. This way brands can focus on developing designs and retailing their clothes. Brands like UCB, ITC outsource their products from subcontractors. Brands give work to subcontractors those provide cutting, make and pack services. Exporters and brands sometimes face problems in terms of quality standards of the product when production gets done by subcontractors. However stitching quality can be controlled. Where does subcontractor get work from? Following are the major sources of work for subcontractors. Export garment manufacturers – as mentioned above, in pick seasons garment exporters book orders more than their own production capacity. In such situation, they look for subcontractors to get production done. In this business process, many times exporters get production done at lower cost than it would cost then by producing in-house. Brands - Domestic brands those don't have their own manufacturing facility, give cut-make-pack orders to subcontractors. Fabric and trims are sourced by brands and given to subcontractors. Designers - Designers need small quantity of garments in particular designs. They prefer sourcing fabrics and accessories by their own. They just need to stitching work by others. So they reach to subcontractors. Following is the simple process flow of subcontracting job. To make explanation easy, I am considering that subcontractor are getting work form exporters. A subcontractor sets up factory with sewing machines and contact with exporters for work. They show their expertise in products and facility they have to exporters and possible clients. Garment exporters contact with subcontractors in their location, show their samples to subcontractors and fix price per piece for making garment (in most cases – stitching only). Subcontractor gets cutting from exporters instead of fabrics. All trims and accessories are normally provided by exporters. If required, trims can be purchased by subcontractors. And expenses are billed to the exporters. Subcontractor stitches garments. A partial garment stitch or complete garment stitching is done. Subcontractors employ pieces rate operators for sewing. Stitching quality is checked by quality assurance team from export house. Stitched garments are sent back to the exporter after inspection. Exporters check quantity received and product quality. This is all about subcontracting in apparel manufacturing. You are welcome to add other features of this business process, if you find something is missing here. This article explains the process of subcontracting business in garment supply chain. Other points related to subcontracting business are - why exporters and brands get their production done by subcontractors? Sources of subcontracting jobs.